Innovative Flow Metering Solutions For SCADA, Telemetry, & Building Automation Systems. 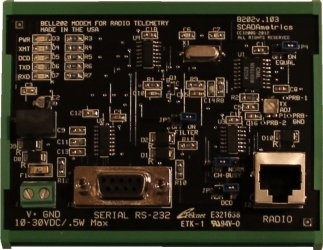 Bell-202 Version 103 AFSK modem for use with analog telemetry radios. Mounts on standard 35mm Din-Rail. Requires external power supply, not included. (typically ~ 12VDC). In accordance with FCC CFR 47 Part 15.103(a,b,c) – the B202 is intended to be used as a control system component at public utility facilities, industrial plants, and within commercial transportation vehicles. It is also intended to be used within industrial, commercial, & medical test equipment. Not intended for consumer applications. Copyright © 2006-2019 SCADAmetrics eStore. All rights reserved.